It is now the end of March 2000 and I have now have received the radiocarbon dating evidence of the Oak Beam, which we have examined over the last three chapters. The date provided asks more questions than it answers. This means that at 2 standard deviations (ie 95% confidence) that the true age of this sample lies between 1890BC and 1520BC. 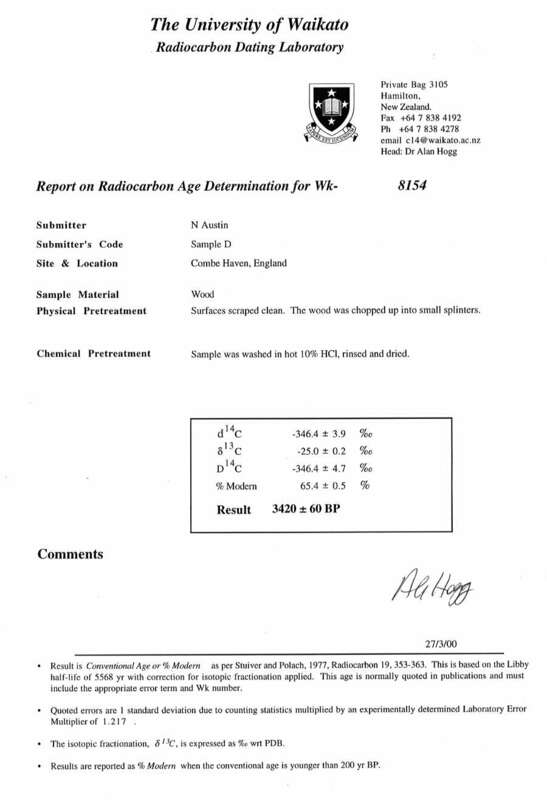 At one standard deviation, there are wiggles in the calibration curve which we use to convert radiocarbon years to calendar years, so there are three possible ranges in age for the sample, each of which is possibly the one which contains the true age of the wood. So there we have it - not the answer we would have liked but one of great significance in any event. One that now asks the question what was this log doing in this inlet having been placed there somewhere between 3,500 and 4,000 years ago? To put this into historical perspective we know that the main circle at Stonehenge was created around 1,800BC, whilst the Phoenicians developed the phonetic alphabet in or around 1,600BC. Ramases II was at the height of his power in Egypt at 1,500BC, whilst at Wilting Farm something was going on in this inlet with a very large oak beam. This first really important archaeological find on Wilting featuring human workings in the sea inlet suggests that more may be there and indeed it may be part of a construction. If it is not part of a construction why is it there at all, in the middle of the inlet, at a time when this was a sea estuary. Was it part of a construction which formed the original Port of Hastings, which we have discussed and has not yet been identified? If so it is incredibly early in the prehistory of the area suggesting a very important prehistory inhabited site. What ever it is this should raise some interest from those other archaologists who work in the area, since it is undoubtedly one of the oldest finds in Sussex, featuring evidence of man working wood. Indeed it may be the oldest for all I know and shall need to investigate this over the next few weeks.